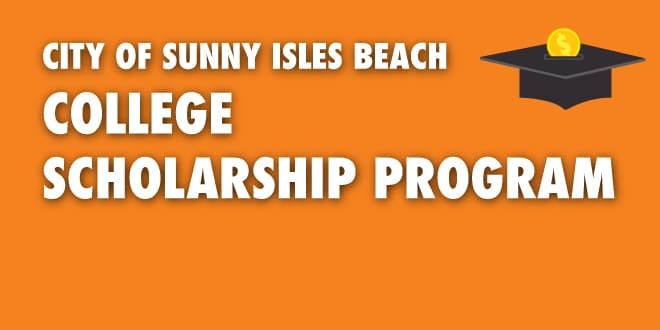 (Thursday, January 24, 2019) – The City of Sunny Isles Beach College Scholarship Program was first initiated in 2010 during my time as a Commissioner. For the last nine years, deserving high school seniors have been granted more than $100,000to put toward their higher education expenses. The idea for a scholarship program originated in June 2010. The Commission realized the value and importance in investing in our youth, and the program’s application process began in January 2011. The first group of scholarship winners were awarded in May 2011. Since then, more than 30 scholarships have been distributed, celebrating the achievements of our deserving high school seniors. Scholarships have always been awarded primarily on their commitment to the community. This opened the door to hard-working volunteers who may not have otherwise been eligible for scholarships that were based primarily on grades. Applicants are encouraged to volunteer for the City and are required to write an essay on how their volunteer work impacted the community. The previous scholarship winners have gone on to accomplish greatness both in and outside of our community. Our winners grew up in our community, participating in our first programs, becoming volunteers and continuing to return to our City. Previous winners have attended prestigious universities in our community and around the country, including, Florida International University, Mount Holyoke College, Cornell University, and Princeton University. Our winners have started non-profits, their own companies, and are working for Fortune 500 companies. Many winners are even still working for us. Our first scholarship winner worked several different jobs with the City and was recently hired as the City’s first Media Manager. Three scholarship winners have gone on to join our current special events team. We now award four $2,500 scholarships each year in April. The 2019 application process is currently open. Though we have a limited amount of scholarships, I encourage all Sunny Isles Beach high school seniors to apply. Awards are distributed based on residency, merit, volunteer work, and financial need. You can read more about the scholarship requirements inside this issue. Good luck!